It’s mid-afternoon at the Westin Ottawa and London, a husky-malamute mix, rests on a pillow near reception where a small replica of Parliament Hill’s Centre Block was built as a cozy enclosure. He’s the centre of attention as staff and guests visit him throughout the day, often repeatedly for a friendly pat or the occasional picture (when he’s not sleeping), as well as regular meals and walks during his stay (24/7, just like any other guest). 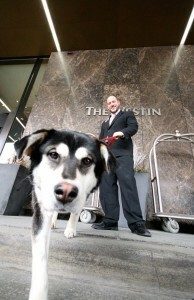 “Sometimes he goes to meetings,” says Ross Meredith, the hotel’s general manager, who explains that London is the fifth dog to find a temporary home at the hotel since December 2015 as part of a new partnership between Westin Ottawa andOttawa Dog Rescue, a non-profit, charitable organization. “Westin is a dog friendly brand,” he continues. “Our guests are allowed to bring their dogs here…and so we reached out to Ottawa Dog Rescue to see if we can help. Even if you’re not a dog lover, it gives way more exposure to the adoption process and the adoption option,” he says. Ottawa Dog Rescue formed in 2013 and supports dogs of all ages, all breeds, for foster-based rescue. “Foster-based rescue means that we have our dogs in foster homes around the city,” says Andrea McCoy, event coordinator for Ottawa Dog Rescue. She notes that Ottawa Dog Rescue, which is only one of more than a dozen animal shelter or rescue organizations in Ottawa, currently has 22 dogs in foster homes awaiting adoption (including London at the Westin). “We have great fosters and they’ll go out and buy their own dog food or special toys for the dogs but we do supply the fosters with everything [such as] food, dog beds, leashes, collars, crates, and we pay for the medical,” she says, adding that money for these expenses is raised through donations, adoption fees, and fundraising. Animal welfare remains an important topic for Ottawa, evident by the substantial turnout of advocates at city hall last Monday who debated a proposed bylaw amendment that would prioritize non-commercial adoption options like humane societies and animal rescue groups by prohibiting pet shops from selling commercially bred dogs, cats, and rabbits. “There’s no shortage of dogs that need homes,” says McCoy, who explains that through no fault of their own, dogs often need a new place to live because their previous owners’ circumstances had changed. Known as “owner surrender”, circumstances include family or relationship break-ups, unforeseen medical or employment problems, as well as moving to a new residence that’s far away or won’t allow pets. “Sometimes when a puppy gets older, it has more energy than the owner expected. Dogs also run away sometimes,” says McCoy, offering other examples and emphasizing that the reasons are infinite. “If we can get dogs into the proper homes, it’s a win-win,” she adds, noting that there are a few persistent myths about rescue animals. “Rescue dogs aren’t broken,” she says. “Some of them are the best dogs I’ve ever met. Look at London. He doesn’t have your typical husky temperament,” she continues.